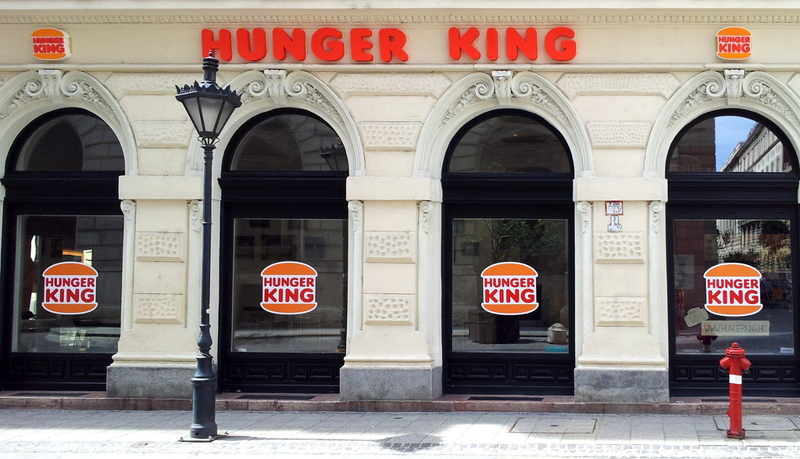 The front of ‘Hunger King’ at the corner of Hajós and Lázár street in Budapest. It takes a few seconds before you realize you’re being fooled. This weekend I was showing a friend around my new home town, Budapest. 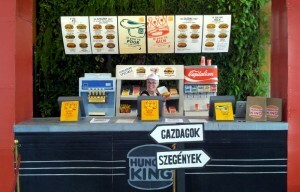 Right in the city centre we encountered a pretty interesting fast food venture: ‘Hunger King’. At first I thought it was a cheap rip-off of Burger King. It used the same font and colours on its store front, and the logo looked suspiciously similar to BK’s. I was inclined to group it with other brand-rip-off franchises like ‘Duffin Dagels’ (Spain) and ‘Uncle Kentaki’ (Libya). But then I noticed the soda machine through the window. It said “Capitalism” on it in large Coca-Cola-style letters. That got me curious enough to go and take a look inside. The fast food restaurant turned out not to be a restaurant at all. Instead it was an installation by Finnish artist Jani Leinonen. With this artwork he attempts to draw attention to the problem of poverty and hunger in Hungary. When you enter Hunger King, you find yourself in what looks like a typical fast-food restaurant… with one big difference: the queue you’re expected to take depends on your economic status. The rich go left and the poor go right*. On the menu behind the counter for your respective queue you can see what Hungary has to offer those in the other line. So if you’re rich, your eyes are drawn to the situation of the poor, and if you’re poor it’s the other way around. The rich go left, the poor go right. A new law was passed that makes it illegal to be homeless. Of course that doesn’t do a thing to address the problem of homelessness. Rather it’s a tool for the government to keep the streets of the (touristy) historic part of town clean and shiny, and force the homeless to go elsewhere. The poor don’t get the same access to housing, education, and social security. The poor in Hungary are presently worse off than during the time of socialism (under Soviet rule). The Hungarian government limits freedom, practices authoritarian politics, and uses the police to harass its citizens. I haven’t been able to verify the last three claims, although the first two are certainly true. The poverty situation in Hungary deserves attention, and the current government doesn’t seem to be dealing with it in any effective way. The newly adopted policy towards the homeless is outrageous, and an example of NIMBY-syndrome. Rich or poor, you always get free WiFi. The artwork lacks nuance. By portraying the current government policies as fascist and all-out bad, it loses credibility. Hungary is a democracy, and the current government has been voted into office by a majority of the population. So far I haven’t seen much of its ‘authoritarian rule’ or ‘police harassment’ out on the streets (as opposed to in much richer cities like Barcelona, I might add). I’m sure that the government does some things right. By losing focus on the real problem of poverty and homelessness and indiscriminately bashing against the right-wing government, Leinonen delivers a less effective message. The message intended with the artwork has nothing, absolutely nothing to do with Burger King or the fast food industry. While there is plenty wrong with fast food chains like McDonalds, KFC, and Burger King–think animal treatment, labour practices, and health issues–they are not to blame for the poverty in Hungary. It is unclear why Leinonen has chosen to use the medium of a fast food restaurant for his message, other than that it’s probably an easy target. Yet this choice of form runs the risk of both distracting from his real message and desensitizing people to the problems in the fast food industry. It’s unfortunate that the artist hasn’t given his delivery a bit more thought. It is commendable that he brings the issues of poverty, hunger, and homelessness in Budapest to attention, and it would have been great to see his effort have more impact. The project runs until 6 July, so if you want to go and take a look you have to be quick about it. 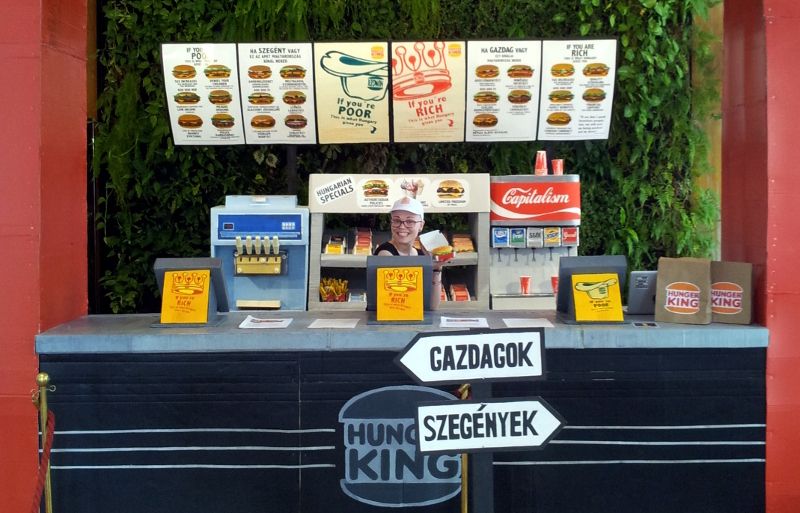 You can find Hunger King at the corner of Hajós utca and Lázár utca in District 6 (behind the Opera). Read more on their website. *As an added gimmick, Hunger King gives away HUF 3,400 (the Hungarian daily minimum wage) to the first 20 people who queue up in the ‘poor’ line each morning. This has the effect of a long queue of hungry/poor people waiting out on the street in front of the installation. Whether this is cleverly poignant or shamelessly exploitative, I leave up to you to decide.